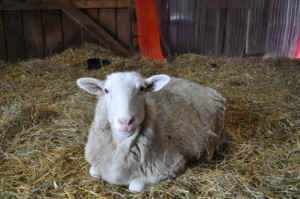 Felix the lamb was not worth the cost of veterinary care for the farm’s owners after he was found injured. Exactly what happened nobody knows, but it was suspected that he was attacked by a predator who ripped off part of his back leg. Luckily, he managed to escape — but due to his injuries, he was tossed into a pen and slated to be “culled” for use as meat later that day. An employee of the farm took notice and brought little Felix to safety, and within days he was transported to WFAS. Felix lived in the house with co-founders Jenny and Doug while his leg healed and for bottle feeding. When it was time, he joined the other sheep and was quickly accepted into the herd. Now full grown, he is one of the friendliest, gentlest, attention-seeking sheep and loves to meet new people. Since it was a rear leg that was amputated, Felix does pretty well getting around his pasture with his remaining three legs, but we watch him carefully for signs of stress to his back or to his other legs. If we find this is the case, he will be fitted with a prosthetic leg to assure he lives the most comfortable, full life he can. Update: We recently drove Felix to Virginia to meet a new specialist who makes prosthetics and orthotics for animals with amputations and limb deformities. His clients are typically dogs but Derrick Campana of Animal Orthocare was willing to give it a shot for a sheep. Felix’s limb was casted to create a socket and measured for size. 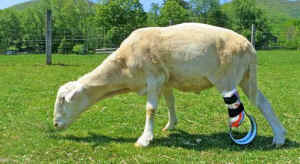 Today his new leg came in the mail and, for the first time since he was just a little lamb, he walked on all four legs! It was such a miracle to see and although there are additional tweaks for alignment to be done, Felix is on his way to life with better mobility. The muscle atrophy in his leg is apparent but with some physical therapy and more practice time, we feel confident that he’ll get used to his new artificial limb. This will save him from stressing out the joints in his existing back leg and help his spinal alignment which could cause pain and problems for him in the future without his new device. Your support helps us help animals like Felix! Thank you!